Welcome to Australia’s Number “1” Jet Fighter Operation providing the ultimate gift idea in the world ,located 1.2 hours drive north of Sydney in the Hunter Valley, or fly right into William town RAAF base. Jet Flight Australia as featured on the Matty Johns Footy Show with Ahn Do, This is not a Museum, this is real!! We provide the public with the ultimate Jet Fighter experience and personal service not yet matched in the industry this is “fact”. Experience the Joy and adventure of a fighter pilot for the day “TOP GUN” style, strapped into our ex military L39 Albatros with Australian Airshow stunt pilot Captain Mark Pracy who has performed for International Super Stars, Eric Clapton, Alicia Keys, John Cougar Meloncamp, Cheryl Crow and many more. Fly with Australia’s market leader in Jet Fighter operations using the best product available in the world of adventure, the L39 Albatros. You are dealing with the “owners” and operators of the Fastest Ride In The Country with a 100% Safety Record. The superior and latest model L39 Albatros also featured in the 007 James Bond Movie: Tomorrow Never Dies. Prices start from $1990 for a scramble mission, 15 minutes of air action..or upgrade to the Top Gun 20 Mission. “Special Note” All Jet Fighter Missions are quoted as “Flight Time” ,this means flying time.This is a Jet Flight Exclusive! Another Market Leading Initiative. Cessnock Jet base is located only a short 1.2 hour drive north of Sydney in the beautiful Hunter Valley fine wine region of Pokolbin ,or a short Helicopter transfer right to the door step. 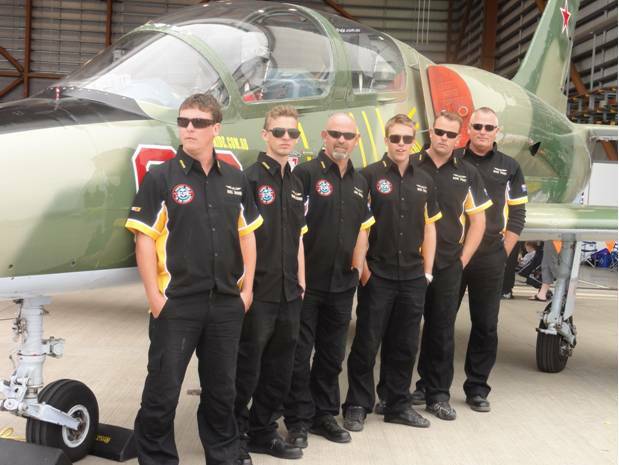 The L39 Albatros is packed with advanced technology superior to any other adventure Jet Fighter in Australia. The aircraft is fully air-conditioned as well as pressurized for high altitude flight, just think of this …. Cessnock to Sydney 9 minutes !!. If its 2 jets you want not a problem give Mark a call on 1300 554 876 . Purchase a Jet Fighter Ride for that special person in your life, with just a $400 deposit and pay the rest in installments or on the day you fly. We also have credit card facility available. Click on the Pricing button at the top of the page for more info, or call Mark toll free 1300 554 876 any time. The rider attends the Jet Fighter base at Cessnock Airport in the Hunter Valley armed with the Mission Statement and map sent out prior. The flight crew will give the safety briefing and you will be assigned your allotted flight suit and flight helmet. You have full communication with the pilot at all times. The ride in this Fighter Jet is no comparison to older style jets around , the L39 Albatros has far superior advanced technology with modern back up safety systems. Jet Fighter Flights of this nature will be remembered forever, as a DVD of the flight is available at an additional cost. Gift Certificates are available and packaged at no extra cost. Complimentary souvenir T shirt is also part of the package for all Fighter Jet Experiences. Interstate travelers can fly direct from Melbourne or Brisbane Airport to Newcastle Airport on a morning flight. We will arrange pick up from Newcastle and a short transfer to our jet base . Fulfill your Jet Mission and relax with lunch and refreshments. Jet Flight will transfer you back to William town (Newcastle) Airport for your afternoon flight or why not drop into Fighter world william town then back home for the evening. All interstate jet riders will receive a $100 discount for traveling to our jet base.